Seaglider offers depth, versatility, and persistence at an operating cost far less than an ocean research vessel. People should like them because they're really cool, but they do like them because they're comparatively inexpensive. Seaglider has proven itself adaptable to a wide range of conditions with many sensors that were never originally intended to be part of the vehicle. It has a track record for very long missions and reliability in extreme ocean environments. It has been used effectively in strong western boundary currents, under ice cover, strong tidal currents, and relatively shallow water. These operating environments were not part of the original design, but the pursuit of specific science questions and engineering excellence have pushed the platform to perform new research missions. In May 2013, UW’s Center for Commercialization licensed the manufacture of Seagliders to Kongsberg Underwater Technology, Inc. granting them sole rights to produce, market and continue the development of Seaglider technology. Commercialization will take Seagliders wider into the environmental monitoring arena and the oil and gas industry. The UW Seaglider Fabrication Center will continue to build and service Seagliders for UW researchers and to service units sold before the Kongsberg licensing. There have been nearly 200 Seagliders manufactured. The vehicle was first developed for oceanographic research  taking measurements of conductivity or equivalent salinity, temperature, phytoplankton concentration, oxygen concentration, etc. More recently, the U.S. Navy has used the vehicle to detect and monitor marine mammals in their operating areas, some of which are remote and/or covered in bad weather, which make visual observations impossible. The oil and gas industry is an emerging market for Seaglider, where it may be used to monitor environmental conditions for offshore operations. Seagliders operate in the world’s oceans. Click for a real-time view of current operations at the Integrative Observational Platforms (IOP) Seaglider page at APL-UW. Kongsberg Underwater Technology of Lynwood, Wash., has acquired the commercial license to produce, market and further develop the technology behind the Seaglider, a UW-developed underwater vehicle that can travel across ocean basins collecting ocean measurements. Kongsberg Underwater Technology of Lynwood, Wash., has acquired the commercial license to produce, market and further develop the technology behind the Seaglider, a UW-developed underwater vehicle that can travel across ocean basins collecting ocean measurements. The agreement was announced this month by Kongsberg and the UW Center for Commercialization. Kongsberg Underwater Technology, Inc. announced today that it has successfully completed negotiations with the University of Washington's Center for Commercialization to obtain the sole rights to produce, market and continue the development of Seaglider technology. The University of Washington unveils its latest underwater inventions, RoboFish and Seagliders, and makes strides in robotic technology. Find out the latest in robotics  both on land and under the sea  from the inventors themselves. Two ocean-diving gliders built at the University of Washington were retrieved late last month near the Hawaiian island of Kauai after setting a world record by traveling a quarter of the way across the Pacific Ocean. Klinck, H., D.K. Mellinger, K. Klinck, N.M. Bogue, J.C. Luby, W.A. Jump, G.B. Shilling, T. Litchendorf, A.S. Wood, G.S. Schorr, and R.W. 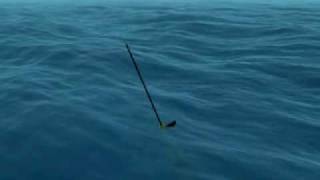 Baird, "Near-real-time acoustic monitoring of beaked whales and other cetaceans using a Seaglider," Plos One, 7, e36128, doi:10.1371/journal.pone.0036128, 2012. In most areas, estimating the presence and distribution of cryptic marine mammal species, such as beaked whales, is extremely difficult using traditional observational techniques such as ship-based visual line transect surveys. Because acoustic methods permit detection of animals underwater, at night, and in poor weather conditions, passive acoustic observation has been used increasingly often over the last decade to study marine mammal distribution, abundance, and movements, as well as for mitigation of potentially harmful anthropogenic effects. However, there is demand for new, cost-effective tools that allow scientists to monitor areas of interest autonomously with high temporal and spatial resolution in near-real time. 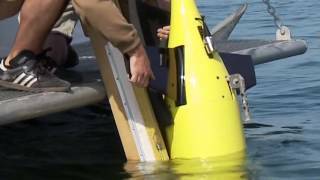 Here we describe an autonomous underwater vehicle  a glider  equipped with an acoustic sensor and onboard data processing capabilities to passively scan an area for marine mammals in near-real time. The instrument developed here can be used to cost-effectively screen areas of interest for marine mammals for several months at a time. 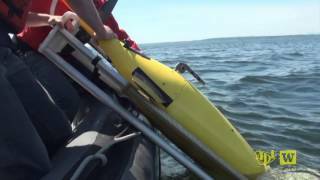 The near-real-time detection and reporting capabilities of the glider can help to protect marine mammals during potentially harmful anthropogenic activities such as seismic exploration for sub-sea fossil fuels or naval sonar exercises. Furthermore, the glider is capable of under-ice operation, allowing investigation of otherwise inaccessible polar environments that are critical habitats for many endangered marine mammal species.